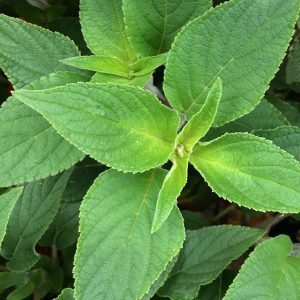 A great landscaping plant, Pineapple sage (Salvia elegans) is a perennial plant that also has edible foliage and flowers. These are not used a major ingredient, rather as a garnish or flavouring. Flowering period is from spring through summer to autumn, red flowers are trumpet shaped and attractive to bees and nectar seeking birds. The foliage is a mid green with tinges of red, when brushed against or rubbed the foliage release a pineapple fragrance. When used as a culinary herb Pineapple Sage is not cooked, it is used more as a garnish, an addition to salads and in cool drinks and cold soups. Traditional herbal medical uses are related to anxiety, antioxidant and antibacterial properties and for its said relaxing effects. This is a rather tallish plant that will reach around 1 metre (3 ft) in height. As it will spread to a similar size, it will benefit from having a little room to grow. It is suited a a background plant and grows equally well in containers. Try underplanting with one of the lower growing herb plants for a good effect. The best growing conditions for Pineapple Sage are in a humus rich well drained soil. In very dry soil or sandy soils the plant may struggle during hot summers. Before planting dig in some well rotted compost and cow manure which will improve the humus content of the soil and add initial nutrition. In cooler climates full sun is best, however in most areas with warmer climates some protection from the heat of the afternoon sun in summer will be best. Pruning is easy, it can be trimmed lightly during the growing season, or pruned back to the ground at the end of winter. It will send up new shoots from the base.